It was an insightful intellectual interaction when Prof. Michael O’Donnell and Prof. Mark Turner from the University of New South Wales (UNSW), Australia visited us to conduct a doctoral workshop recently. It was indeed beneficial for us to commit more towards management research. Having a vibrant research centre led by Prof. J.A.S.K. Jayakody with a group of young management researchers drawn from several management faculties, PIM is geared to spearhead vital management research. 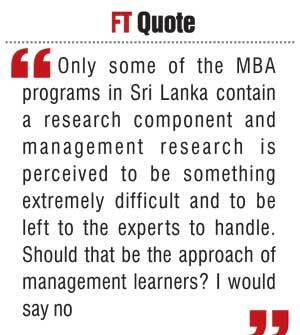 Today’s column attempts to look at what hinders management research in the Sri Lankan context. Management research is a part of the wider array of research. While positive initiatives are being taken, the current situation with respect to research in Sri Lanka is far from being at a satisfactory level. I read an article written by Dr. Jayaratne Pinikahana sometime ago highlighting the need to focus on the private sector collaborating on university research. He shared some revealing statistics about local research. In such a context, any move to strengthen the research rigour, particularly among the university community, is commendable. As I observe, there is a clear need to create better awareness over the importance of research. This I see acutely in the field of management. Only some of the MBA programs in Sri Lanka contain a research component and management research is perceived to be something extremely difficult and to be left to the experts to handle. Should that be the approach of management learners? I would say no. Why are management learners reluctant to embark on management research? I would propose that we need to overcome barriers associated with management research. Let me discuss seven such barriers. I have seen management learners scared to engage in management research stating that they do not have the necessary skills to do so. Skills can be acquired in a variety of ways. The same is true for management research skills. Last week, we looked at the contents of a newly-published textbook on management research. The starting point is an inquiring mindset. When you have a problem in focus as an unsolved puzzle, a logical step-by-step approach is needed in understanding the nature of it, and finding solutions for it. There are range of ways to strengthen the skills of doing management research including through books, websites and short courses. It is encouraging to see that the pioneering academic institution which started offering an MBA program to Sri Lanka is still maintaining a research rigour, making it a vital component in MBA education. Some tend to complain that the extent involved in a management research is so vast. The scope is there for the researcher to decide. I have heard many of my senior colleagues say that management researchers want to cover everything under the sun and the moon. Instead, they should clearly demarcate a boundary within which their investigation will be carried out. A beginner can start studying on his/her organisation or even a division of it. On the other hand, a veteran researcher will clearly identify the scope which is relevant to the nature of the problem under investigation. For example, in a study of employee satisfaction, instead of covering all employees all over the world, a demarcation such as ‘middle level managers of private commercial banks in Sri Lanka’ would be a more sensible scope. The fundamentals of research say that we study a sample as we cannot cover the entire population. It is an issue of depth and breadth. You can do an island-wide survey but the depth of the investigation can be rather shallow. Instead, selecting a reasonably sized sample that represents the characteristics of the population can be a more practical approach. Continuing on the earlier example, selecting middle managers from one bank or from several banks is a decision on sample size. There is no one universal approach to management research. Diverse patterns can be seen in moving beyond traditional number-crunching practices. Hence, it is clear that there is no universal style towards management research. The challenge is to select the style matching the nature of the investigation. Some management researchers insist on a formal structure in approaching research. The world is moving towards multiple structures. In the recent past I have seen how storytelling is a powerful way of narrating management research. In perusing through the fundamentals of management research, two key structures can be found. They are related to an exploration or an explanation. The twin terminology associated is deductive and inductive in its approach. A deductive approach begins with an initial idea or conceptualisation of the problem in focus. It is applicable when substantial knowledge is already in existence. In contrast, the inductive approach begins with the observation of realities and then moves towards generalising the results. It is more suitable when available knowledge is insufficient to develop predictions. Each approach leads to a different structure of management research. It is difficult to say which is better out of the two. A more pragmatic approach would be to find the best fit with regard to the nature of the problem under investigation. Some management researchers complain that they have no access to sources of information in formulating the problem. There is no one source but multiple sources are available in order to gain knowledge. There are electronic databases that contain thousands of research papers. In some management programs, instead of access to a physical library, the students receive a username and password, inviting them to visit a virtual library full of versatile resources. On the other hand, there is a wealth of local management research, sadly not yet available in electronic form. Visiting several management institutes will serve the purpose instead. Hence, the source should in no way be a constraint in conducting management research. There is a need for guidance with regard to management research. The usual practice is to seek the support of a supervisor. However, the supervisor is only a guide and the researcher has to take the ownership of the project. Assumption that being dependent on the supervisor will ensure research success is a myth. Here, the emphasis is on self-reliance and confidence in oneself. A supervisor can give valuable suggestions and guidance through grey areas but he or she is not there to do the research for the researcher. The right use of the supervisor in asking the right questions is the preferred approach. Of course, in critical junctures, the supervisor’s wealth of experience will be of help in making the correct decision. Therefore, being overly dependent on external support will not take a researcher anywhere. Management research has to gain renewed enthusiasm in Sri Lanka. The presence of several annual research conferences and the availability of several management journals are a welcome sign for a better future. A lot more needs to be done to ensure that management research contributes to the development of the Sri Lankan economy while enriching the body of knowledge. In such a context it is essential to be aware of the above seven myths and to overcome them wherever possible. We need more management researchers who will genuinely add value in broadening our understanding, in turn contributing to individual and institutional development. When such research projects happen, we can look forward to a high impact on economic growth with socio-cultural implications. I refer not only to the success of a research project but the subsequent benefits to humanity at large.